Visit either VanDusen Garden or Bloedel Conservatory through April. Each time you scan your VBGA Membership card you are entered to win great prizes. Winners will be drawn weekly on April Tuesdays. Applicable for both New and Returning Members! New VBGA Members who purchase a membership in-person, over the phone, or online in April will be entered to win great prizes! Prizes drawn on May 2nd. Six (6) Member Only Mornings at VanDusen Garden from 8am-9am. Bloedel Walk & Learn by John Coupar, Vancouver Park Board Commissioner & Bloedel Strategic Advisory Committee Liaison. Thur, April 11th, 1-2pm. Meet at Bloedel Conservatory entrance. John is the son of the Bloedel Conservatory’s first Garden Director Charles Coupar. Please join John as he shares his unique perspective and connection to the Conservatory. VanDusen Garden Walk & Learn by Camil Dumont, Vancouver Park Board Commissioner. Wed, April 24th, 10:30am-12noon. Meet in Visitor Centre Atrium. Camil’s walk through the Garden will include his favourite spots and the Park Board’s perspectives on the importance of Botanical Gardens as part of Vancouver and our ecosystems. Thur, April 4th, 1pm-2:30pm. Meet in the Visitor Centre Atrium. Join VBGA educators for an informative walk to learn about conservation efforts taking place in the Garden and plant species listed as endangered under the IUCN. Sat, April 6th, 1-3pm in the Backyard Bird Garden – Family Friendly Discovery Tables. Mon, April 8th, 11am-12noon. Meet in the VanDusen Garden Visitor Centre. Talk and book launch Gardening with Native Plants of the Pacific Northwest. Join Education Director Gillian Drake, and take a walk through the rainforest to discuss tropical ecosystems and the interactions and symbiosis between various plants and animals. Witness adaptations for survival, and hear stories about cultural uses of plants in the tropics. Online registration is required, maximum capacity of 12. Register here with Promotion Code: APR17. Free to members. Fri, April 5th, 11:30am-12:30pm at Bloedel Conservatory. Join Vicky Earle, a natural science, medical and botanical illustrator and VBGA Board Director, as she introduces you to and engages with the exotic birds in the Conservatory. 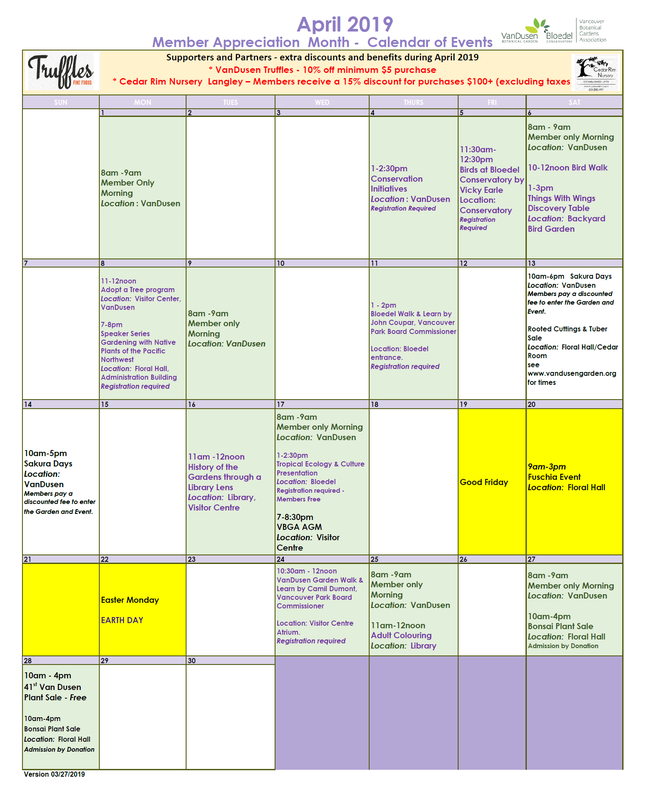 See Calendar for additional discounts with our VBGA Partners!